20 November 2006 18.30 � 20.30, The Romanian Cultural Centre, 8th floor, 54-62 Regent Street, London W1B 5RE; Tel. 020 7439 4052, ext 102; e-mail: mail@ratiufamilyfoundation.com Click here to see an image related to this event. �Remittances from international migrants have increased substantially over the past three decades. It has become essential that their huge potential for economic and social development is used. In order to adopt measures to increase their flow and stimulate their investment in productive activities, one must understand the motives behind remittances and learn from the experiences of other countries. Romania will become member of the EU. in January 2007 and will remain a labour exporting country to more developed economies. 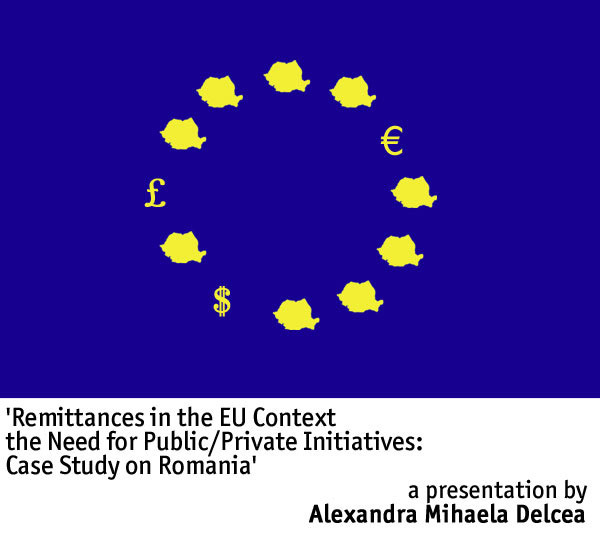 Thus, remittances sent by Romanians are likely to increase. The book also looks at the Romanian migrants in the UK. Hypothetical future scenarios are discussed with the aim of encouraging public/private initiatives to attract remittances in various mutually beneficial investment projects.� (Alexandra Delcea) Alexandra Mihaela Delcea is currently studying towards the exams in insurance organized by the Chartered Insurance Institute (UK). She obtained the master in Economics from UCL in 2005, with three distinctions in Money and Finance, Microeconomics and Macroeconomics. Her Master dissertation, �International Remittances (Motives and Impact)�, comprised an overview of the theory and empirical evidence in the economic literature and an incursion in the case of Romania. Part of the dissertation has been submitted to the international conference on migration organized in Romania and published in �European Identity and Free Movement of Persons� (University of Oradea Publishing House, 2005). Alexandra did her undergraduate studies in Economics and Management at Pantheon-Assas University in Paris, finishing as head of promotion. Following this, she received the Socrates scholarship and graduated in International and Development Economics at the University of Essex, with first class. This presentation is part of the CULTURE POWER program which is initiated by the Ratiu Foundation UK. The program consists of a series of seminars focused around a presentation followed by a constructive dialogue with an invited audience. Organised by The Ratiu Foundation UK. More details on www.ratiufamilyfoundation.com.